For many terminators, Republic of Qatar is a promising direction for landing calls. It is no coincidence because there are excellent conditions to start a business in the field of telecommunications. Qatar is a paradise for terminators, since the rate of immigration is quite high. It constantly accumulates a large amount of international traffic. In addition, the country ranks third in the world in terms of the penetration of GSM-communication. With a population of 2.3 million people, the number of connections is about 3.7 million (160%). As one of the richest countries in the world, Qatar attracts migrant workers and migrants every season. There are 4 migrants for one thousand of inhabitants. Local companies employ people from neighboring countries, where Arabic is spoken. In Qatar, there are a lot of immigrants from India, about 545,000 (23.58%), Pakistan (18%), Nepal (17.3%) and other countries. Accordingly, the terminators often install their GSM gateways and land international GSM traffic, getting a handsome profit. It is worth mentioning that guest workers are often housed near the capital Doha and in special camps around industrial facilities. As a rule, there are excellent GSM communication and the Internet. It is recommended to install the termination equipment close to these objects. According to the data of Fitch Group, the telecommunications sector in the country is at the flowering stage, as the FIFA World Cup 2022 is going to take place here. Experts predict an increase in the number of GSM users. In July this year, officially, there were 4.86 million subscribers. With regard to the Internet, it is used by 1 million 186 436 people, which is more than 69% of the population. On the basis of the total population of Qatar, statistics show that one in two has at least one SIM-card of each GSM-operator. Terminators install SIM gateways in Qatar to get a stable high income. In recent years, the demand for traffic termination has increased, with amounts from 20 to 50K frequently requested. Last March originators offered 15-20K of traffic, but this year the amount reached 50K, and even 100K. The most popular operators are Ooredoo (3 million users) and Vodafone (1.4 million subscribers). 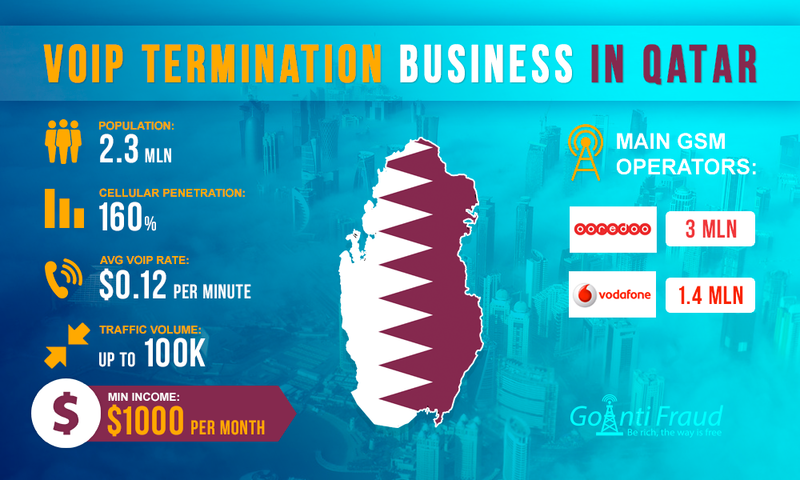 In order to terminate in Qatar, you can find the tariff plans, with which minute local call will cost up to $0.08. With the voip call price per minute of about $0.12, a terminator can make $1,000, using the minimum amount of equipment of. However, it is better to connect the multi-port gateways like goip 16. Then your income will increase according to the number of channels.